At ACM Design, our home design approach to every architectural and interior design project is about more than simply delivering services. It’s about making a difference for each family—from the way you experience your home to knowing you have invested in quality. By integrating the architecture with interior design and outdoor living design, we work with you to create a beautiful and timeless home, weaving together function and aesthetics while staying true to your vision. From the overall concept to the smallest detail, our architects and designers are advocates for our clients throughout the entire process, ensuring schedules stay on track, work is performed to specification, and the personality of your custom home shines through. Identify with the client. Understanding how you live or how you want to live is critical to the success of designing a home that meets your needs. Our Residential Architecture Questionnaire gives you a way to express the basics of what you need and want in your home. Sharing photos or magazine clippings that you have likely collected over the years will shed further light on your vision of home. Even the smallest detail provides us with insight. Embrace the site. Walking the property to get the feel of the land and its natural attributes is crucial. Observe how the sun moves across the land. Pinpoint the best views. Assess form, function and accessibility to understand how the home will “fit” on the site. Think, dream, think, dream. Information is processed. Design ideas begin to take shape through a unique balance of technical analysis and creative intuition. Create, dream, create, dream. Thought takes form through conceptual sketches illustrating how the house could work on the site, how the rooms could work together, and how the home might look from the outside. This is the time that the overall team, client and designer, shares ideas, discussing what is working and what needs to be adjusted. Function and aesthetics. 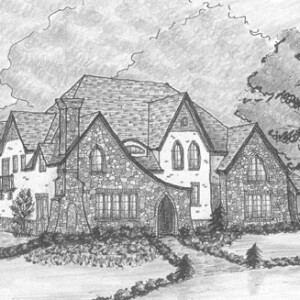 Study the conceptual design with floor plan and exterior elevation sketches. Ensure that the functionality of the spaces balance with the aesthetics of the design. Consider the landscape and how to “ground” the home. Continue the conversation. Ongoing communication with the client ensures that the design works and stays true to the vision of home. Think, draw, think, draw. Expanding our drawings from floor plans and exterior elevations to building sections and details will show us the particulars of the design and construction. Finalize the overall skeleton of the home structure, from the floor to the roof. Life on the inside. Once the architectural design of the home has been developed, the focus shifts to interior details. Once again, balance is key between function and aesthetics. Thorough and complete. Once the design of the home has been thoroughly developed, both inside and out, it is time to ensure that the technical drawings are thorough and complete. All of the details and specifications must be clear for construction, so that the pricing your builder prepares is accurate. An extra set of eyes. Things always come up during construction…rock underground, substitutions which offer options for savings, “found” space in a corner of the attic. We are there through construction to help you manage challenges and take advantage of opportunities. Common thread. We know the design of your home inside and out so that when changes come about, they are considered in the full perspective. Since your team expands to include the builder that will construct your home, clear communication is critical. That’s why it is comforting to have ACM Design as your advocate to ensure that even the smallest details are not overlooked.